By the mid 1800s, most of the fertile land in Ireland was in the hands of landlords, forcing the Irish to survive on smaller plots, until they became totally dependent on the crop that could produce the most yield per acre – the potato. It was difficult, but at least they weren’t starving for potatoes are a remarkable source of vitamins and minerals. Then late on August 20, 1845, a potato fungus was discovered at the Dublin Botanical Gardens. The following day, August 21, is a date remembered in Irish history as the first day of An Gorta Mor – the Great Hunger. Within the week, reports came in from all over Ireland that the potato crop had turned black in the ground. It was the only crop affected, since everything else grew in abundance, but those other crops belonged to the landlords who exported them to England for profit. Parliament did little to help either, quoting the economic doctrine of Laissez Faire: leaving the country to the effect of natural forces. Many died in ‘45 awaiting a better harvest in ‘46, but it didn’t come. The potato crop in ‘46 was totally destroyed. People were forced to eat what little seed potato they had, and when ’47 came, there was nothing to plant. Many who hadn’t starved, fell victim to the diseases which attend hunger. When the sick and starving Irish couldn’t pay their rent, they were evicted. As blight destroyed the crop of 1848, millions died of starvation and hunger-related disease on the roads, alongside prosperous farms. Limited aid was provided and there were some soup kitchens, but in some, the cost of receiving food was conversion to the Church of England. It was too high a price for many and they turned their backs on the food, rather than on their God. Parliament, denounced for not intervening in the tragedy, reacted by declaring the crisis over in 1849. They showed a few acres of potatoes grown that year with no sign of blight. But it was of no help to the Irish since they had been evicted. While the potato blight slowly abated, the blight on the Irish continued. Most historians estimate that the effects of the great hunger were not over for 30 years as the lack of land or living wage, food shortage, and disease continued. Emigrants sent money back to loved ones they were forced to leave behind to help them, but it would be a generation before emigrants could establish themselves in the lands to which they fled. In the end, most of the generation who suffered the Great Hunger, were gone before its effects were. One benchmark event that marked that turn in history was the formation of the Mayo Land League in August, 1879. Founder Michael Davitt convinced MP Charles Stewart Parnell to join it became the National Land League. Branches were formed in almost every County and they began what became known as the Land War. It was only then that it could be truly said that the Great Hunger was over and the Irish began to take back their land. One of the most insensitive events to come out of the Great Hunger was the British premature declaration of the end of the crisis in 1849. To show that all was well, a massive publicity campaign was mounted, the highlight of which was a visit by Queen Victoria in early August 1849. As the Irish starved and died in the workhouses and on the roads, hundreds of thousands of Pounds were spent to beautify the roads on which she would travel. Crowds of onlookers were kept in check by British soldiers as reports were sent to the world that wherever she went, the Queen was cheered by her adoring subjects and headlines proclaimed “THE FAMINE IS OVER AS THE QUEEN VISITS IRELAND.” Ironically, that report – though propaganda in its time – would eventually come true. The truth of that statement lies in a most remarkable incident that occurred on the exact anniversary of the first day of the hunger, exactly 30 years after the blight had been declared over! On August 21, 1879, beside the Church of St. John the Baptist in Knock, Co. Mayo, a small group witnessed an astonishing vision. Three figures, surrounded by a mysterious glowing light, suddenly appeared, beside an altar on which rested a cross and a lamb surrounded by adoring angels. They knew that they were in the presence of St. Joseph, St. John and Mary, the mother of God. Word spread and others arrived and saw it too. The people fell to their knees and prayed, oblivious of a soaking rain. The figures remained, silent for nearly two hours and vanished as suddenly as they had appeared. 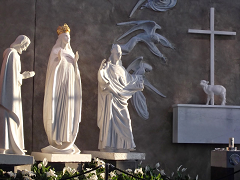 After years of intense investigation, the apparition at Knock received canonical sanction and ranks with Lourdes and Fatima as a holy site of pilgrimage, yet it is the only appearance of the Virgin during which She said nothing and only stood praying. Praying for what, for whom? An answer can be found in the date of the apparition. If the Great Hunger wasn’t over for 30 years after 1849; Mary appeared in 1879 – exactly 30 years later on August 21, the exact anniversary of the first day of the Great Hunger! Is it possible that, since the Irish had suffered so much for their faith, that the Lord sent His beloved mother; and that She, as any mourner would, stood in silent prayer for the generation which had just passed away. The timing is incredible for not only is August 21 significant, but the year 1879 was truly the end of the great hunger as the Irish began taking their land back from the landlords; it was just one week after the formation of the Land League in nearby Castlebar. While the dates have an uncanny significance, there is yet another irony. Since August 1879 marked both the historic end of the Great Hunger and the year in which Our Lady visited Knock, a 30-year old newspaper headline had at last come true: THE FAMINE WAS FINALLY OVER AND THE QUEEN HAD VISITED IRELAND – the only Queen that the Irish ever recognized ! The Catholic people of Ireland, who struggled so hard to keep their faith alive had received a visit from heaven, and the Virgin had received a new title – Our Lady of Knock. There was yet another event that made 1879 special in Irish history; on 10 November of that memorable year, Padraic Pearse was born!